The recorded history of Budapest shows the unification of the former smaller towns of Obuda, Buda and Pest in 1873 was the crucial moment when the future trajectory of Budapest was decided. However, most historians agree Budapest could not have become the thriving metropolis everyone appreciated during the late 19th century, as well as in the first half of the 20th century without the contribution of the so-called Chain Bridge. Built 14 years before the unification, the Chain Bridge was the first permanent bridge over the Danube, ensuring a reliable transport, economic and cultural connection between Buda and Pest, between west and east. One might rightfully state that the absence of a connection of this kind could have prevented or, at least, delayed the unification of Budapest. It is to Count Istvan Szechenyi that Budapest owes the initiation of the project to build a bridge between the two banks. The story goes this local count was dissatisfied with how much he had to wait in order to cross the Danube on the former temporary bridges, a moment when the idea of building a permanent bridge occurred to him. In honoring his contribution (which does not confine to the idea exclusively, but to his consistent sponsorship efforts), the bridge bears his name. The chief architects were William Tierney Clark (in charge with the architectural design as such) and Adam Clark (commissioned to supervise the construction works). William Tierney Clark was the architect who also designed the Marlow Bridge over the Thames in England, and the resemblance between his Hungarian achievement and the English bridge is said to be quite striking, though not at all surprising. The bridge is also appreciated for its aesthetic qualities, being embellished with marvelous ironwork and yielding stunning views at night when illuminated. It is neither the longest (measuring 375 meters in length) nor the largest bridge in Budapest, but nonetheless one of the most important. Major reconstruction works were carried out in 1949, subsequently to the serious damages suffered in 1945 in the context of World War Two. 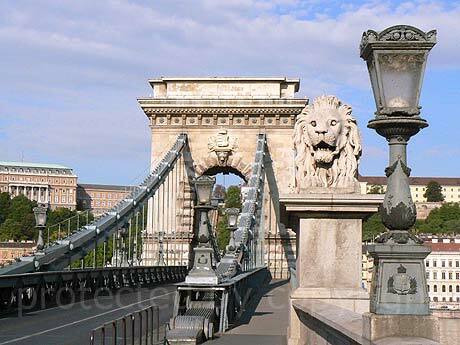 At present, the Chain Bridge is, next to the Hungarian Parliament, one of the worldwide renowned symbols of Budapest.